Join us for a thrilling shark diving encounter at Tiger Beach, Bahamas with no cage between you and the action. Scuba dive with Tiger Sharks, Lemon Sharks, Caribbean Reef Sharks, Great Hammerhead Sharks, and other species at the world famous Tiger Beach Bahamas (an underwater beach!) and off shore of Bimini for the Hammerheads. 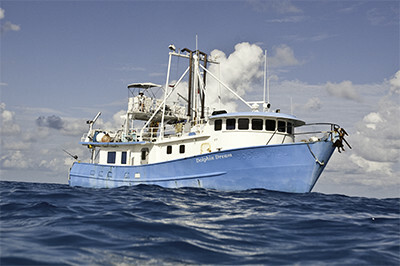 Shallow depths mean longer dives and our liveaboard means diving all day and into the night. Photographer Gregory Sweeney hosts this cruise which leaves from West Palm Beach Florida. 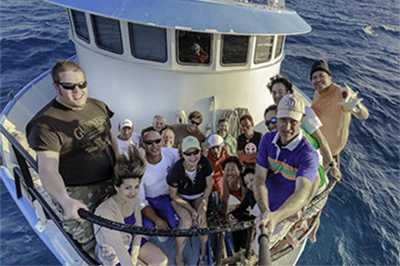 A 7 day shark diving live aboard adventure! Dive the clear waters at Tiger Beach and be surrounded by Tiger sharks, reef, lemon sharks, and the occasional bull and hammerhead. This is the start of mating season with many large females showing up . A 9 day live aboard adventure! 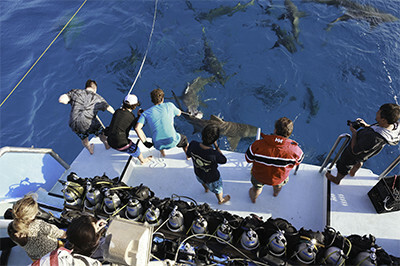 First we dive at Tiger Beach for 5 days, then cruise down to Bimini for hammerhead action off the coast. Your host Gregory Sweeney is an experienced underwater photographer who has been on this trip many times and wants to share the thrill and magic of these threatened species with like minded divers and photogaphers. The waters of the Bahamas are well known for its clear visibility and bright sand bottom. The 86’ vessel is both comfortable and built for safety and has plenty of room for camera equipment to be properly handled. No cage means you are as close as you can get to these beautiful animals with no obstructions in your photos. Diving among Tiger Sharks in the Bahamas from Gregory Sweeney on Vimeo.